FCNR (Foreign Currency Non Resident) account is fixed deposit account offered by banks in India to non resident Indians (NRIs) and is operated in foreign currency. 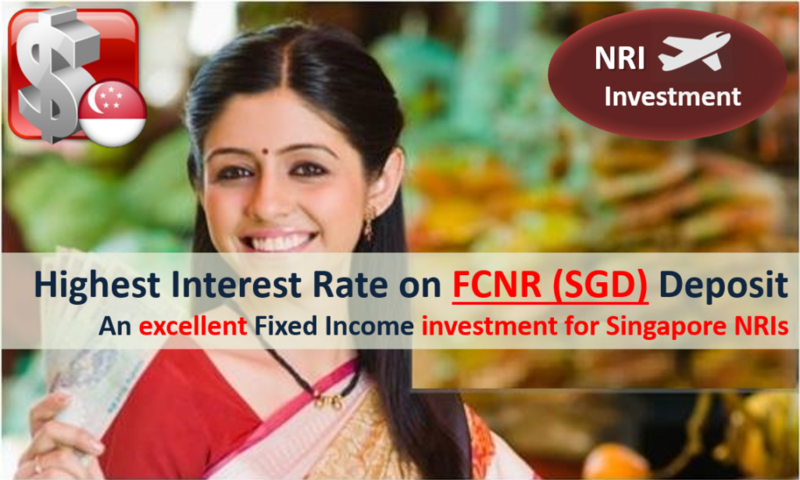 FCNR deposits are good investment option for NRIs in Singapore as the interest rate offered by banks in India are way higher than that offered by banks in Singapore. For instance one of the biggest bank DBS Bank, Singapore have interest rate in the range of 0.35% for one year deposit to 1.20% for five year deposit. In comparison ICICI Bank offers 2.65% for 1 year deposit and 2.60% for 5 year term. The second advantage is Singapore taxes only income generated in the country and not worldwide income. Hence for NRIs in Singapore the interest earned on FCNR deposit is tax free as its neither taxed in India nor in Singapore! The third benefit is the principal and interest earned is fully repatriable, which means NRIs can transfer their money back without much formalities. The fourth advantage is the investor has NO currency exchange risk as you deposit in foreign currency, the interest earned is in foreign currency and when you withdraw you get back the amount in currency in which the deposit was made. This post compares the interest rate offered on SGD (Singapore Dollar) FCNR Deposits. The table below compares the interest rates offered on SGD FCNR deposits across various tenures. The highest FCNR rates have been highlighted. Also We have DBS bank and OCBC Bank Singapore as benchmark for comparison. As can be seen Lakshmi Vilas Bank, Karnataka Bank, Federal Bank and City Union Bank pays highest interest on FCNR deposits in Singapore Dollars. The minimum deposit tenure for FCNR FD is 1 year and maximum tenure is 5 years. The interest is compounded half-yearly. In most cases there is NO penalty for pre-mature closure of FCNR deposit account. However in case of premature closure before completion of 1 year, no interest would be paid.